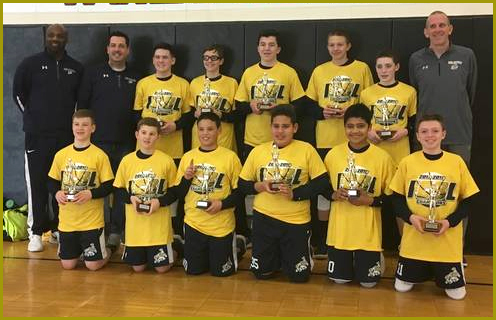 Milford Knights blue 7th Grade boys earn second 3-peat pf the year! 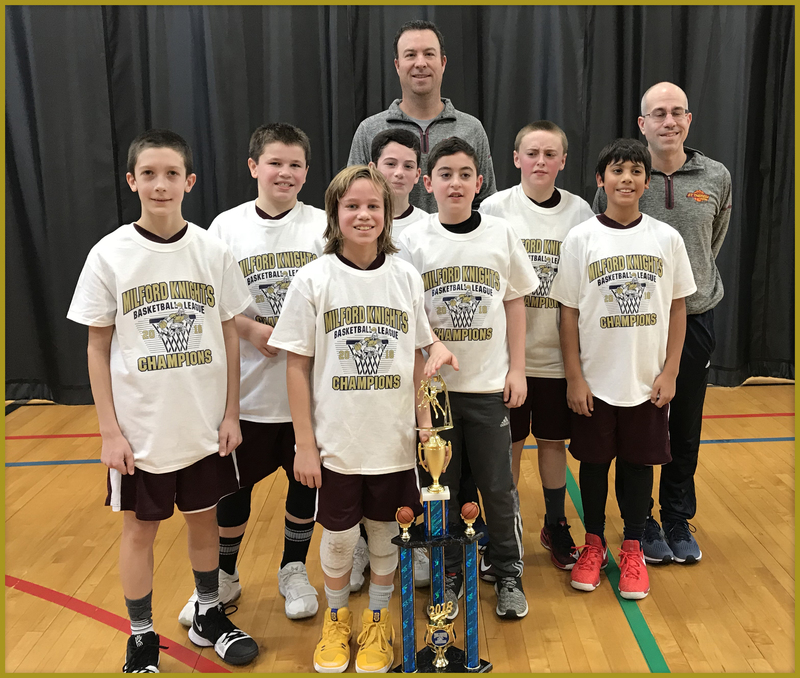 The Milford Knights Blue 7th Grade Boys' travel basketball team captured its second Championship 3-peat of 2017-2018 when they defeated West Hartford Travel on Saturday for their 3rd consecutive FCBL AA Championship. 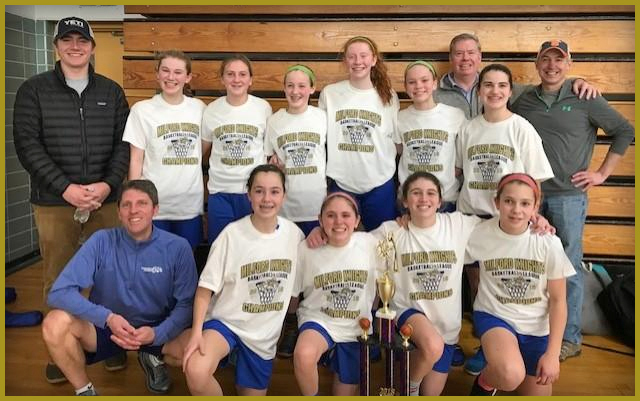 Earlier in the year, the Knights won the Milford Rotary Sunday League Championship. The Knights run to the FCBL Championship began with a match up against division rival West Haven. 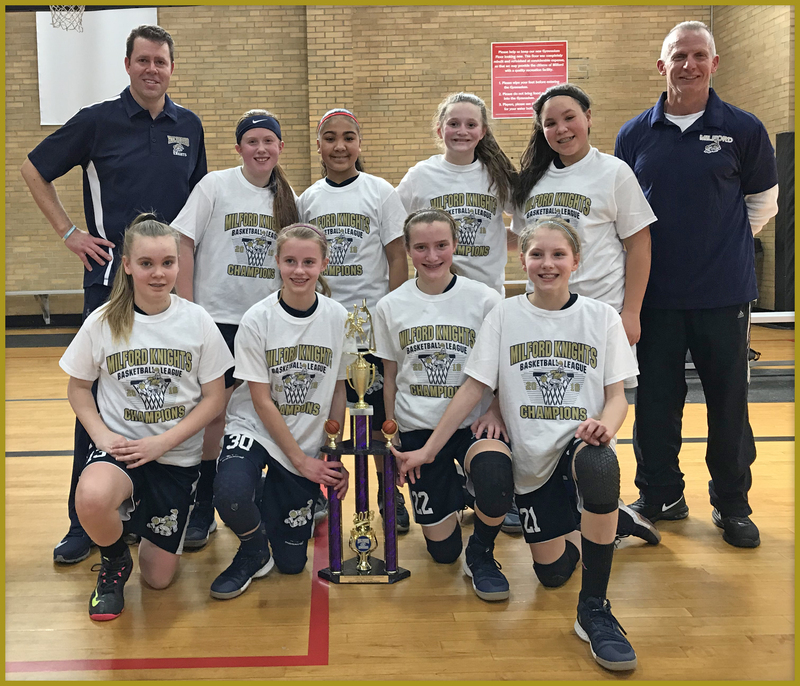 West Haven already owned 3 victories over the Knights this year, including a win in the final minute over the defending champion Knights in the 2018 InSports Holiday Tournament Final. In this opening round match up, West Haven would jump out to an early lead. Nolan McKenna-Hansen got the Knights going with an offensive rebound put-back and Ethan Long followed with a 2 and a 3 to cut the West Haven lead to 11-7. John Neider added a driving lay-up and Dominic DiFederico chipped in with a free throw to end the first quarter with West Haven holding a 16-10 advantage. Brendan Buchner and Long would add second quarter 3's, McKenna-Hansen 3 free throws, Zach Worzel 2 free throws and Riley Jordan 1 and the Knights cut the West Haven lead to 30-26 at the half. In the third quarter Ethan Long poured in 6 points and McKenna-Hansen went 5 of 7 from the charity stripe to cut the West Haven lead to 39-38. In the decisive third quarter, the Knights pulled away with an impressive performance at the free throw line. John Neider went 3 for 3, Worzel 1 for 2, McKenna-Hansen 1 for 1 and Ethan Long 9 for 15 as the Knights went on to a 61-54 win. Offensively, Ethan Long led the way with 29 points, McKenna-Hansen 15 and Neider 7. 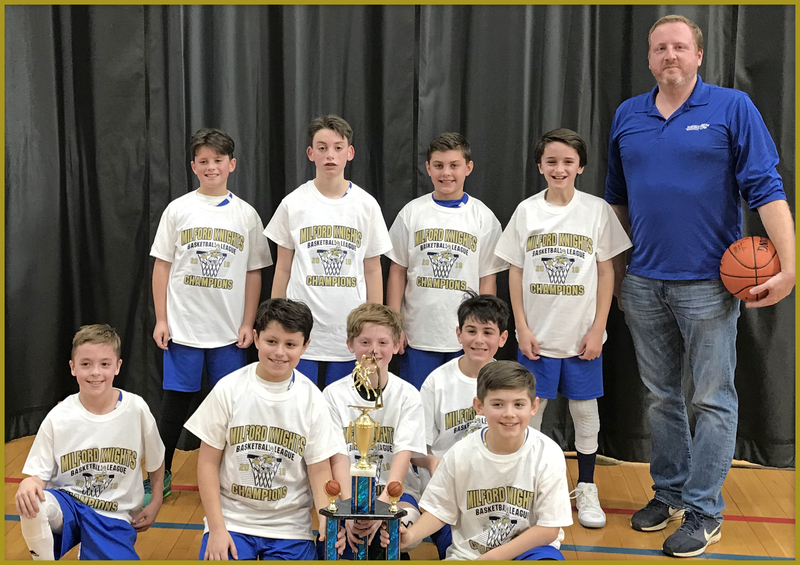 The semifinals saw the Knights take on Stamford JCC Blue at Ludlowe High School. Ethan Long got the Knights going with 10 first quarter points and Cole Pleimann buried a deep three from the corner, but the Knights still trailed 19-17 after one quarter. The second quarter saw the Knights continue its hot free throw shooting with Riley Jordan, John Neider and Nolan McKenna-Hansen all sandwiching free throws around baskets making the score 28-28 at the half. 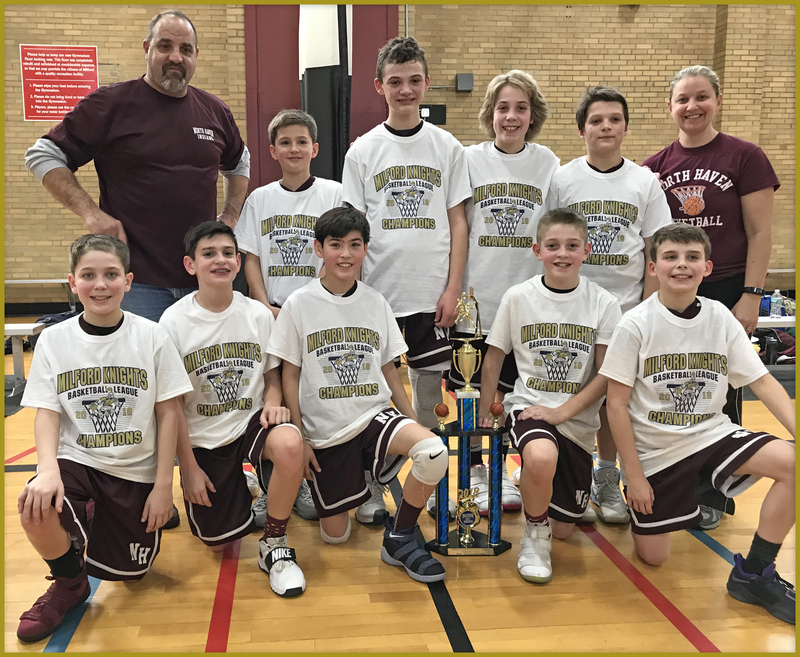 Brendan Buchner got the third quarter scoring started with a jumper from the top of the key and Zach Worzel added a pair of baseline jumpers as the Knights kept pace with Stamford. McKenna-Hansen started the Knights scoring in the fourth with a bucket in the paint, Neider and Ethan Long added 3's in the back and forth game. Zach Worzel would score the Knights' next 5 points to keep the score tied at 53 at the end of regulation. Again, it was McKenna-Hansen opening the scoring in OT with an And-1 and Long added a 3 to give the Knights a 59-54 lead. Stamford would cut the lead to 59-56 but two free throws each by Long and Worzel would put the game out of reach 62-56 and send the Knights on to the Finals. Facing a 25-6 West Hartford travel team, the Knights would rely on their suffocating zone defense to lead the way. Brendan Buchner, Zach Worzel, John Neider and Nolan McKenna-Hansen each had baskets in the first quarter as the Knights jumped out to an 8-2 advantage after one quarter. West Hartford would turn the tables on the Knights in the second quarter to cut the lead to 14-12 at the half. In the third quarter, the Knights would face a tough test. After 4 points to start the quarter, swingman John Neider had to be helped from the floor with an apparent ankle injury forcing the Knights to dig into their bench. Riley Jordan, McKenna-Hansen and Ethan Long all added baskets as the Knights held a 26-20 lead. With their Championship hopes on the line, West Hartford was not going down without a fight. West Hartford got the fourth quarter scoring going with a deep 3 to cut the lead to 26-23. Zach Worzel hit 2 free throws to extend the Knights lead to 5. Another West Hartford 3 cut the lead to 2, but McKenna-Hansen added a free throw of his own to bring it back to a 3 point lead. West Hartford would respond with yet another 3 to tie the game at 29. John Neider returned and added a big bucket and McKenna-Hansen chipped in with 2 free throws as the Knights went up 33-29. A West Hartford free throw would cut the lead to 33-30 and then a deep bank-shot 3 would tie the game at 33 which sent the large West Hartford faithful into a frenzy. A John Neider basket gave the Knights a 35-33 lead and West Hartford would respond with a free throw to cut the lead to 35-34 with 26 seconds remaining. A foul in the back court would put Ethan Long at the free throw line where he calmly sunk 2 free throws giving the Knights a 37-34 lead. After seeing West Hartford already drain 4 3's in the quarter, the Knights would need one last strong defensive half court stand and they did not disappoint. After garnering a long rebound off another 3 point attempt and West Hartford foul would send Ethan Long back to the free throw line. 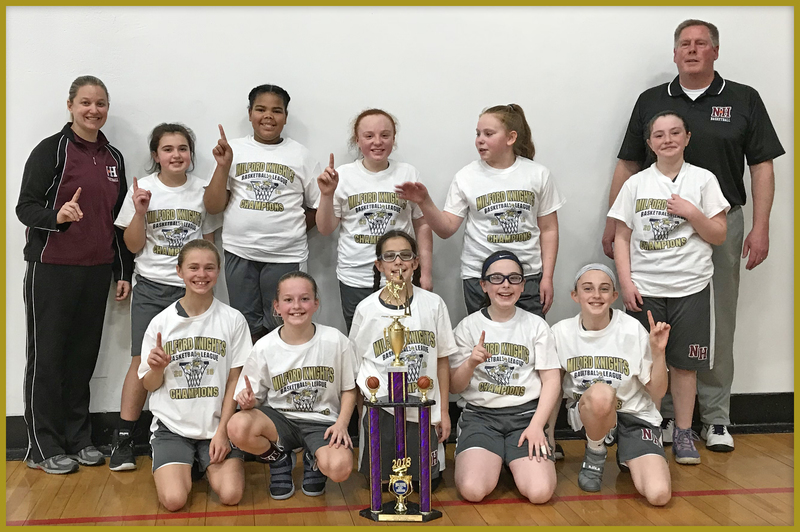 With 6 seconds left, Long sunk both free throws putting the game out of reach and giving the Knights their 3 consecutive FCBL title, 39-34. 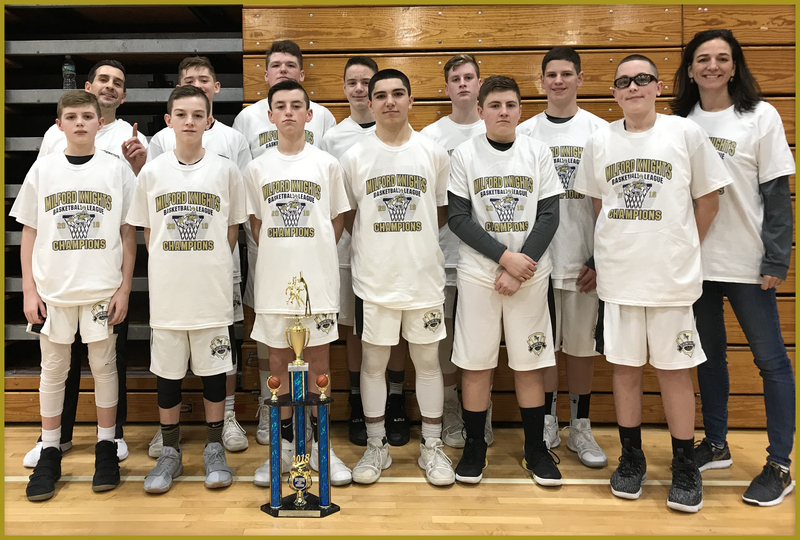 While defense and free throw shooting were the keys to this years' title runs, strong play from the Knights' reserves certainly played a huge role. Defensive trapping specialists Riley Jordan, Jack Aliberti and Aidan Ryan forced numerous turnovers during the run. Sharp-shooter Cole Pleimann added leadership and key baskets from the outside. Big men Dominic DiFederico, Jeanero King and Jacob Cupole all provided valuable minutes down low en route to the Championship. The 27-16 Knights will next face Branford Travel in the Quarterfinals of Hoopfest on Saturday. Hoopfest is the only Tournament the Knights have entered and yet to win, bowing to Westport PAL in the 2016 Final and 2017 Semifinal. 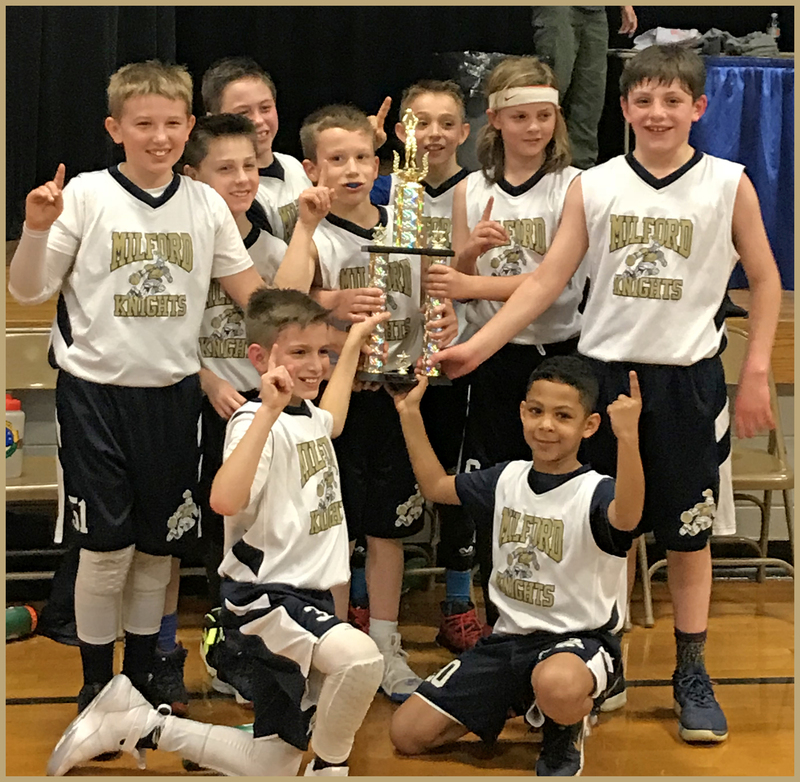 Congrats to Milford Knights Grade 4 Boys! 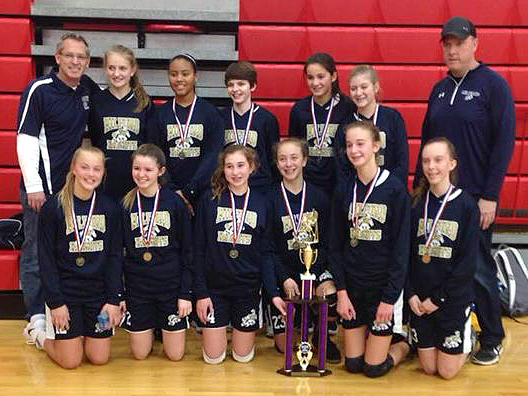 WINNERS of St. Mark's tournament AND Branford Tournament! CONGRATULATIONS TO ALL KNIGHTS LEAGUE WINNERS! 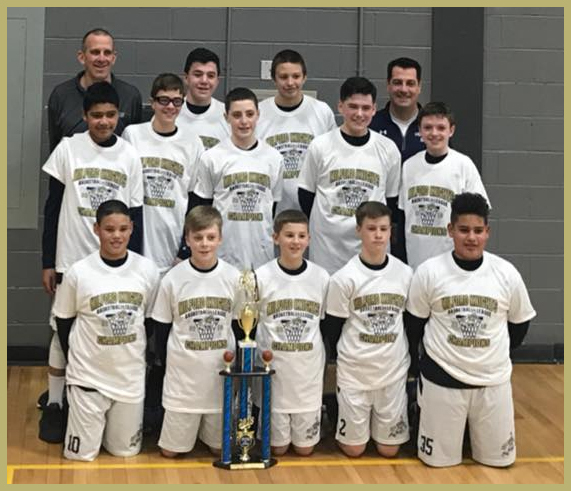 The Milford Knights Blue 7th Grade boys Travel basketball team won it's 3rd consecutive MKBL Sunday League title with a thrilling 41-37 come from behind victory over Stratford PAL Sunday at Jonathan Law High School gym. Ethan Long got the defending champs off to a 3-0 lead with a deep 3 to start the game. Stratford would cut the lead to 3-2 and take a 5-3 lead on a 2 and a 3 from the top of the key. A basket in the quarter's final seconds gave Stratford a 7-3 lead after the 1st quarter. Nolan McKenna-Hansen hit 2 free throws to start the Knight's 2nd quarter and Brendan Buchner added a 3 of his own to tie the game at 8. Cole Pleiman added a baseline jumper and Buchner another 3 to cut the lead to 16-13 at the half. Stratford tried to pull away from the Knights in the 3rd quarter with the Knights only mustering 2 field goals, one basket each from McKenna-Hansen and Zach Worzel and cut an 18 point deficit to 13 after 3 quarters, 31-18. For the 4th quarter, the Knights would turn to their suffocating press defense led by guard's Riley Jordan and Cole Pleiman who created turnovers into Knights easy baskets. The first a deep 3 from John Nieder off a Jordan pass and the second a baseline jumper from Zach Worzel to cut the lead to 8, 33-25. Worzel would add 2 free throws and Jordan a free throw to cut the lead to 5, 33-28. Brendan Buchner hit a jump shot to close it to 33-30. Nolan McKenna-Hansen sunk 2 free throws and followed with a nice up and under move to give the Knights their first lead at 34-33. Stratford would tie the game at 34 with a free throw with less than 2 minutes remaining. On the following inbounds play, Brendan Buchner buried a 3 from the corner to give the Knights a 37-34 lead, only to see Stratford respond with a basket of their own cutting the lead to 37-36. A converted free throw once again tied the game up for Stratford at 37. On the ensuing possession, riding the hot hand, the Knights called the same out of bounds play again for Buchner, who calmly drained another corner 3 with 15 seconds left giving the Knights the lead for good 40-37. Buchner would add a free throw to seal the win for Milford 41-37. The Knights were led offensively by Buchner's 15 points, McKenna-Hansen 11 and Zach Worzel 6 points. Riley Jordan and Cole Pleiman highlighted the defense. Jack Aliberti, Aidan Ryan, Jeanerro King, Jacob Cupole and Dominic Difederico chipped in with valuable minutes off the bench for the Knights. The Knights path to the Championship started with a 28-22 win over St. Thomas of FFLD in the Quarterfinals. 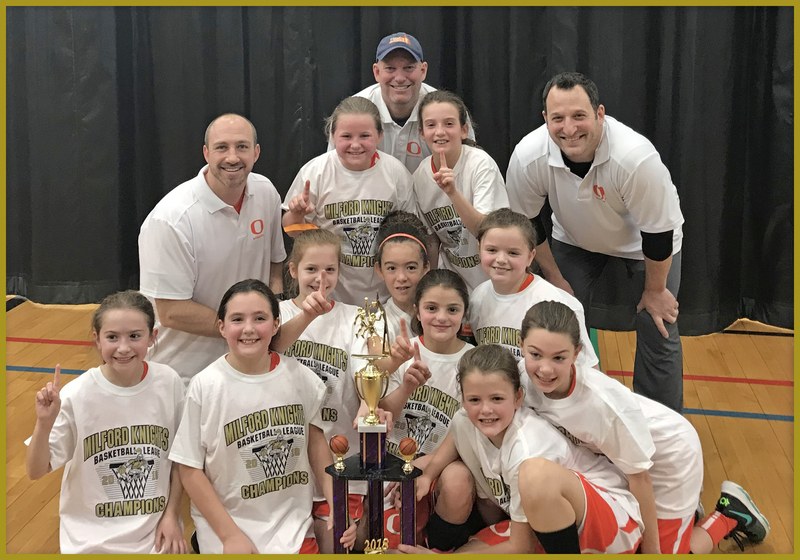 The Knights then took on top-seeded Orange in Saturday's semifinal, where the Knights cruised to a 32-18 win. The Knights will next take on Wilton in a rematch of last year's FCBL Championship game in a non-league contest to prepare for the upcoming FCBL Tournament which starts 3/1 against New Milford. 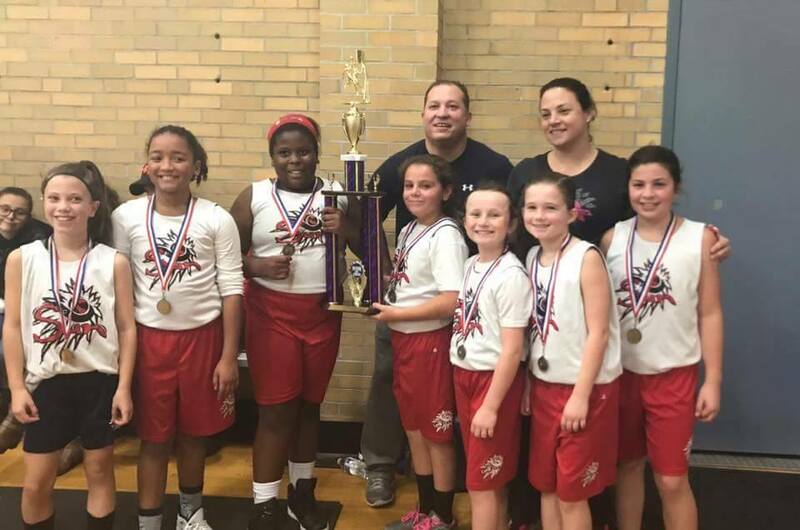 Congrats Milford Sun 10U girls! 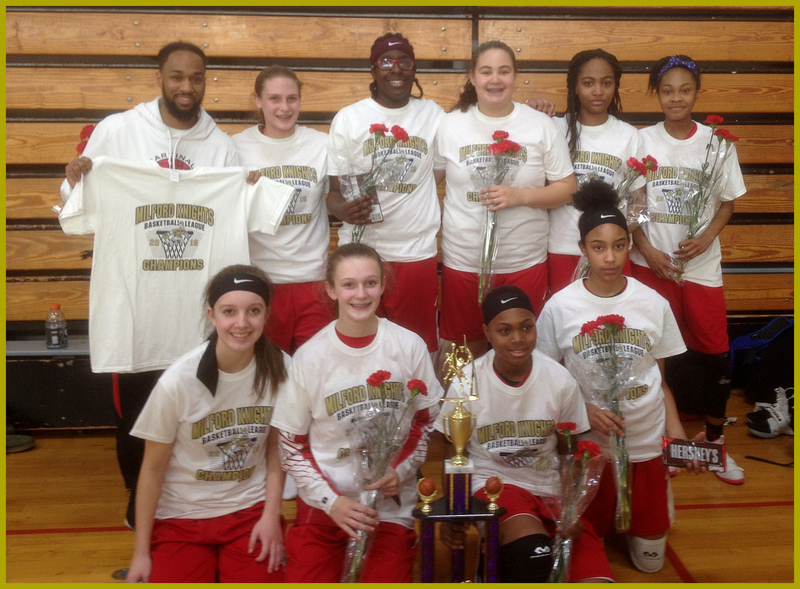 Tip-off Tourney First Place! Great job! 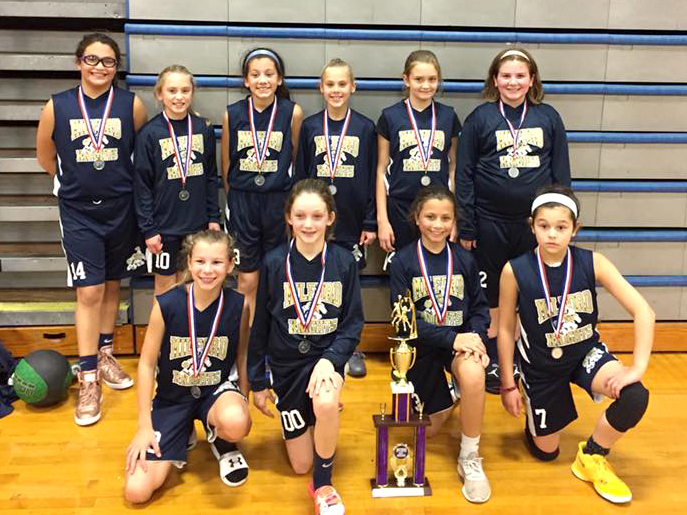 So proud of these girls in the Tip-off Tournament! made it to the finals before losing to a tough St Theresa team 21-19.